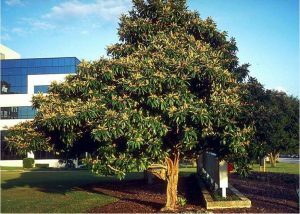 This is the Top 10 of Mediterranean high yield low maintenance trees. An alternate title would be “10 Trees Every Mediterranean Forest Garden Should Have”, and they are traditionally in orchards known as Mediterranean Rainfed Gardens. The Mediterranean climate is a dryland climate. The interesting thing is that actually almost as much precipitation falls in the Mediterranean climate as many temperate climates, only it happens all at the same time, namely during the wet winter months. The rest of the time its blue blue skies, and not a drop of rain, for up to 8 months at a time, depending on where you are. The vegetation has adapted itself to these circumstances, and in Mediterranean climates you’ll find trees that are drought resistant, yet make the most of the winter rains as well. 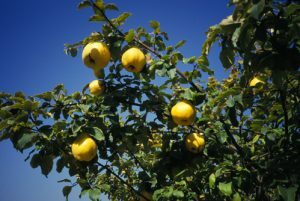 Over time people in the Mediterranean basin have developed gardens and orchards picking the productive species that are adapted to this climate type. The following list is an approximation of the species used in such a rainfed garden. However, as mentioned below as well, many of these species, especially those bearing fruits profit from being planted close to sources of water, which they can access with their roots. Mediterranean rainfed gardens are very effective perennial systems; we’ll discuss how to establish one, but first lets explore some cool trees that we’d put in it! The life giver of the Mediterranean. The Olive tree is a very slow growing low maintenance tree that might not be your first choice if you want fast production. However, it is a keystone species of the rainfed Mediterranean Forest Garden. 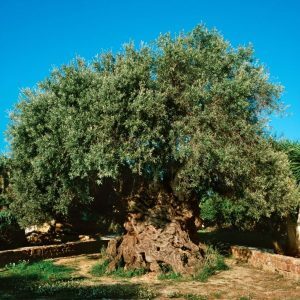 Your children and grandchildren, and grand grand grand children will thank you for planting this generous tree, that will provide your family for centuries with delicious olives, beautiful olive oil, and medicinal olive tree leaves. Furthermore, the wood of the Olive tree is incredibly precious and beautiful! If you ever get your hand on any, you might want to take up woodworking and make that handcrafted mortar and pestle you always wanted! Dried figs, fresh figs, figs cakes with almonds, fig mixes with dates, fig jams, fig liquors, and the list goes on and on. Fig trees are beautiful low growing gigantic parasol like creatures, that create amazing shade if left to grow unpruned. A great way to design with this tree is placing it in a spot where it creates shade in summer, and as it’s decidious, a place that profits from sun in winter. There are many varieties, and its worth finding that variety you love the most! They are technically not fruits but inside out flowers, that are pollinated by wasps, and you need multiple figs to get good fruit. Although they are extremely low maintenance, it’s important to know that just like Pomegranates and other Mediterranean fruit trees they will want to be planted closer to valleys or other niches where water can accumulate, and otherwise they’ll appreciate some water at the right time, if rainfall has been very low. One last thing! 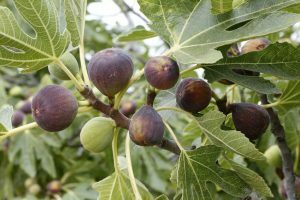 Figs thrive in stony soils, often calcareous, when their roots are constricted they start sending the energy up to the leaves and fruits. 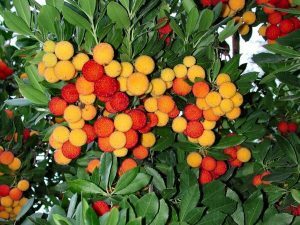 Strawberry tree, or also Medronheiro in Portuguese, is an amazing tree that thrives all along the Mediterranean, and has different cousins around the world. The fruit is unusual; the ripe fruit has an exquisite taste, and when yields are high the pickers of this fruit are known to get sick of eating them while they pick them! The texture is different from most fruits, not juicy at all, and a bit grainy even. Also the skin looks special, with a beautiful dark red colour and a rugged surface. The fruits are most famously used to make an incredible hard liquor called Medronho. There is nothing in the world like Medronho, and the art of its distillation is a day of celebration! You can guess how it’s celebrated. The tree grows wild and thrives a variety of soils. 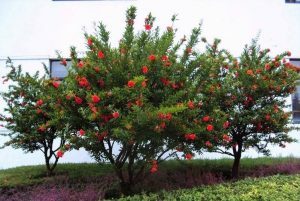 Although the Strawberry tree is suitable to plant as part of your Forest Garden, it fits perfectly as well in a zone 4 wild harvest area, as an understory for windbreaks, and in barrieres, hedges and fedges. Even zone 5 benefits from this tree as it is essentially a wild tree, and sometimes missing as keystone species on your land. This exquisite and little known fruit has a reasonable growth rate, and being one of those fruits also likes to be planted close to water; waterlines, valleys, streams or water catchments like swales etc. The loquat will produce huge amounts early on in its establishment. In full sun and with some water it will produce the sweetest little round orange fruit, which can be eaten straight off the tree, or made into a jam or other kind of condiment. The skin can be a bit thick, some people don’t like to eat it, and it has quite large seeds. The seeds shouldn’t be eaten, however they are traditionally used to create Amaretto-like liquor, called an Amagre in Portuguese. Who doesn’t know real marmalade? Well, almost no one!! Surprisingly enough, when the British popularised marmalade (from the Portuguese marmalada) they thought, because of the orange colour that it was made from oranges. Nope, real marmalade is made from the quince, which turns orange when exposed to oxygen. Many kids in the Mediterranean have strong chilhood memories of their mom’s marmalada, and the standards are very high, when it comes to this homemade delicacy! The low maintenance tree, like apples and pears, is from the rose family, and it produces beautiful big white pinkish flowers in spring. Just be aware that the branches grow in a way that make the tree somewhat prickly, and this can be an issue when harvesting from adult trees. The almighty carob! 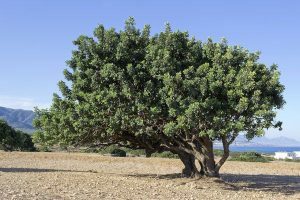 Also known as St. John’s bread tree, carob grows predominantly in calcareous soils and is therefore found mostly along coastal regions. The carob is a relatively slow grower, and a generous giver. The pods and seeds are very nutrient rich and traditionally used as high quality animal fodder. The seeds have historically been used as a measure of quantity, and the word carat by which we measure gold, is linked to the name carob. The pods have a delicously sweet taste, and you can chew them straight off the tree. For human consumption the pods are dried, seeds removed, then ground up into a powder from where it can be used to make bread. Furthermore its a delicious chocolate substitute, and carob can also be used as a thickener in cooking and baking. Enjoy! On to one of the most amazing and undervalued trees ever. This versatile tree is perhaps best known for as the food of the famous silkworm. Here on the farm we have both the Mulberry as well as the silkworms, which are really fun low maintenance pets for kids! Our little daughter loves to observe them and feed them Mulberry leaves. 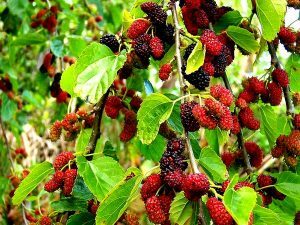 The red Mulberry is more well known for its delicious fruit. The fruits are really heavenly (fresh and dried), and there is a substance in them that has clinically been proven to help with weight loss and sugar level regulation in the body. The Mulberry is very low maintenance and it’s easy to propagate from cuttings. It resists drought, waterlogging and flooding, the young leaves are edible in salads, the leaves are amazingly nutritious fodder for animals, the bark can be made into paper, the wood has woodcrafting uses, and the list goes on and on! Mediterranean climates need more of these!!! Last but not least, topping our list of useful Mediterranean climate trees that need very low maintenance is the world famous Almond! 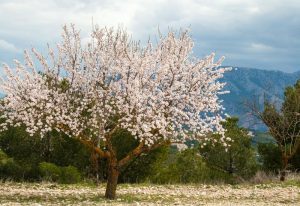 The almond tree is another typical Mediterranean rain-fed productive tree species. Belonging to the branch of stone fruits, and therefore also in the rose family, the almond tree is well known for its beautiful early pinkish blossoms, before it has any leaves. Three years after planting they start yielding copious amounts of almonds. Choose your varieties well, because sweet almonds are created through selection and grafting and are not true to seed; wild almonds will mostly taste bitter. These bitter almonds are used to make the above mentioned Amaretto type bitter almond liquors, and the bitter almonds are said to be medicinal, because of their high organic cyanide content. Almonds are delicious and nutritious, soak them before eating, make your own almond milk, or like our local old ladies you can mix them with figs and make amazing fig cakes. Let us know which trees should be in this list according to you! We would be happy to keep you up to date about similar content. After you sign up you can specify what else you're interested in. We respect your privacy, we will never send you Spam, and you can always opt-out. Enjoy our free content, and may it inspire you to take action! I am not sure about this at all, but should olive trees be included in a fire resistant trees list? I always thought that they have a fairly high oil content, which is what makes them dangerous in a wild fire. But you said that you had forgotten to include olive trees in the list? What do you think? Are they fire resistant? This is a very difficult topic to research isn’t it? But I agree with your observations about the fires in Portugal. Now there have been horrific fires in California. I am glad you love mulberry trees so much because so do I. I have a loquat too. Hi Gaynor, thanks for your feedback! Yes, Olive is mentioned in various cases as a good fire resistant tree, and a particularly interesting one because it has naturalized in all Mediterranean climates. It is drought resistant, because it manages to retain much humidity; it’s leaves are small, rigid, and have a waxy coating for this purpose. Also, it regrows very well if it’s been damaged above ground, thanks to it’s powerful root system. The oil you speak of is present in the fruit, the actual olive itself, which consists of about 10% – 15% oil and 75% – 80% water. It would follow that in the specific time period that olives are ripening the olive as potential source of a flammable fuel is probably insignificant. However, as various articles also state, the effectiveness of the olive tree is enhanced if you reduce the amount of fuel that might grow beneath it, so dry grass for instance. In addition, I could imagine that a combination of tall dry grasses AND dried olives fallen on the ground could also put the olive tree’s fire resistance to the test. This article mentions the observed efficacy of olive groves and grape vines during fires. And this brochure also mentioned in the same article has a nice list of fire resistant plants and trees that includes the Olive as well. Keep in mind, everything has its proper place in a designed fire landscape. Olives would in my mind fit well further out in your line of fire defense, perhaps in your zone 2, 3 or 4 even. With the higher maintenance and higher fire resistant species closer to your home, and the less maintenance yet still fire resistant species further out. Hope this answer is useful to you. It is indeed a somewhat complex topic to research, however if you dig deep there is a staggering amount of research, articles, books, techniques and strategies that have been documented and proven to work. I’ll put a resource list on the website.